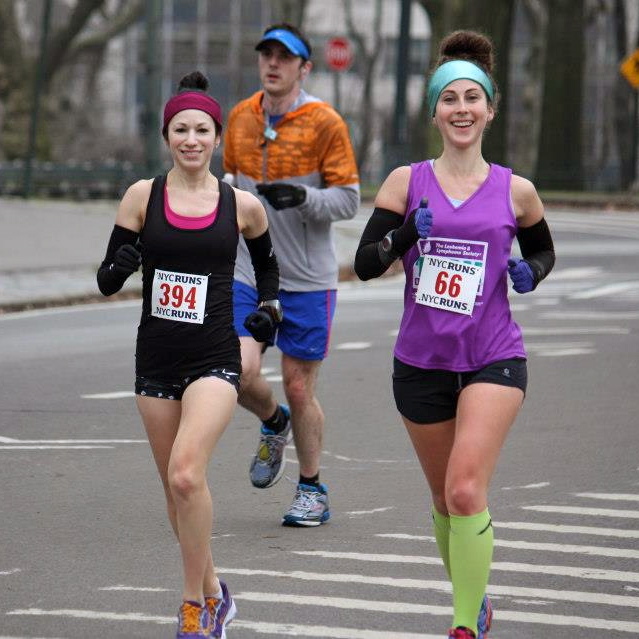 Today was the NYC Runs Central Park 10-Miler, my first official timed event of the year. While I hesitate to classify this as a true race recap – I went in decidedly not racing the course – it was a great way to usher in spring marathon training. When Ashley mentioned running this together, I couldn’t refuse! She’s a great running partner. Proof? 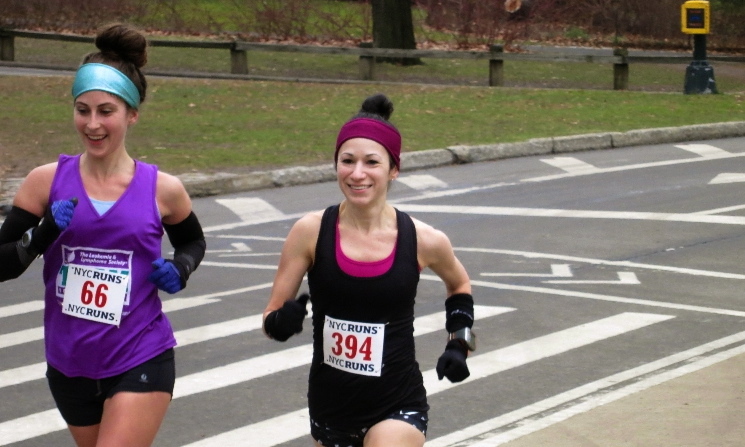 We’d previously tackled three hot, grueling Central Park loops together during the NYRR 18-Mile Tuneup, and her company makes the miles fly. Since we’re both starting another round of marathon training, we agreed to keep a moderate pace (~ 8:30 min/mi). The weather was completely uncharacteristic for a northeast January. The city was covered in a humid layer of fog with temperatures hovering in the mid-40s. Conditions were perfect for a tank top, arm warmers (which became unnecessary mid-race), and shorts. It almost defied logic to dress this way in the midst of winter. Plenty of room on the course. 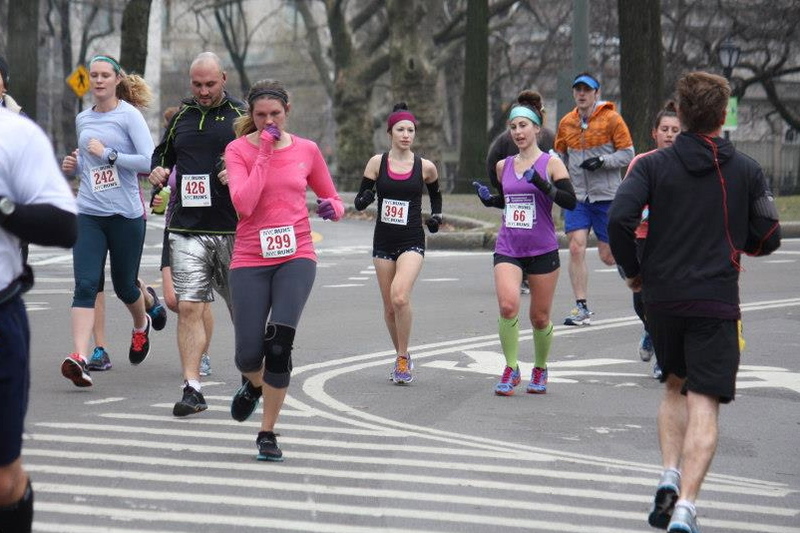 I quite enjoyed running my first NYC Runs event. The participant field’s capped at a small, manageable size. I’d seen this when volunteering at their Roosevelt Island Hot Chocolate 5k/10k race. Since there’s no need for start corrals, you’re able to line up as you see fit based on your pace and goals. The course isn’t over-crowded and has plenty of room to run from the start. It’s a very low-stress experience. The 10-mile course consisted of two 5-mile loops of the park. We started on West Drive, not far from Tavern on the Green. Running counter-clockwise, we ran through the lower loop, up East Drive, up Cat Hill, crossing west again at the 102nd Street Traverse. We returned to West Drive hitting the rolling west side hills. The small nature of the race also meant Ashley and I ran into a lot of runner friends while there. We saw Jocelyn, Abby, Meggie, Fiona, and Susan at the start, running parts of the course together. We also saw Jess doing her training run. And, on each lap we saw Erica and Steve cheering the runners, taking fantastic photos of the race. Ashley, Fiona, Erica, Leticia, Abby, Susan, Me. Overall, I felt great throughout. Because I’ve a tendency to get caught up in races, I’m pleased I stuck to my plan and controlled my pace. With Eugene Marathon training officially kicking off on Monday, 1/14, these miles were a chance for final base building. Having run two 10-milers in the past two weeks, I feel prepared to jump into my training schedule. After injury, it was a confidence-booster to run 10 miles continuously, at a decent pace, pain-free. 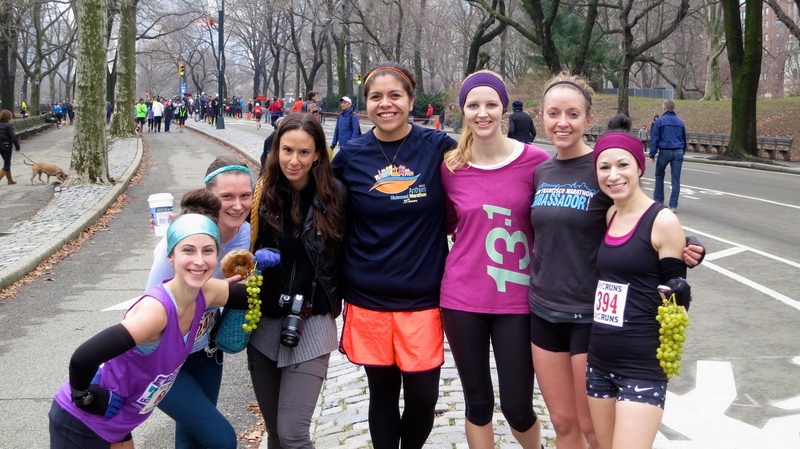 For a great photo gallery of the race, check out Steve’s work on his site, NYC Running Source. This is also a terrific resource for current running news and upcoming races in NYC. Now, let the training begin! Congrats on an awesome race! I loved the NYC Runs Hot Chocolate 5k. Smaller local races are so much more fun and less crowded. Despite having a terrible half-marathon here in rural WA, the race itself was wonderful. I’m really excited there’s an organization to provide alternate races! Thanks, Jen! I’m really starting to enjoy the smaller races! My marathon in Florida was about 300 people…and it just made me realize how great it is to have space to settle into a run rather than negotiate around a bunch of people. What happened at your WA race?? This was so much fun to run! Also, check out silver shorts guy ahead of us! Aww man, I love Central Park, lucky! Such perfect running weather and the race looks like a fun event…I mean, heck, they give you grapes. Good luck with your first week of marathon training! Thanks, Dominick! The run was great – and a nice way to kick off training. The time between training cycles went way too fast…probably because I spent most of it healing up my foot. Back to it! Are you training for anything now? Time off tends to go extremely fast but let’s not act like you really took it easy at any point. I am training for a half marathon next month but am really just working through a marathon training program in preparation for RAGNAR SoCal, and mainly to stay in shape. I have an option to do New York City in November and as of right now I am 95% in…just making sure I want to commit to training in the summer heat. What are you doing about NYC? Sounds like you’ve got some fun races coming up. NYCM – I have a guaranteed spot already for ’13 from doing the local NYRR’s 9+1 program. I may use the deferral from ’12 to get into ’14. I have to decide. Sounds like YOU have a fun race schedule. I will have to keep an eye on your goals for NYC and see if we end up in the same corral ( I will have to speed up! ), so at least I will have someone to chat with for a couple hours. Super cute race photos! Congrats on such a strong race!